Christmas 2013: where are we now and where are we going? Amidst all the hustle and bustle of this Christmas season, a thought struck me. I began to wonder where as a soceity our focus is. Is it on material things or is it on the simple things that make what would be a dull and dreary life in this world a life instead filled with meaning and love, all the things that make life worth living? Where are we now, as a society? And where are we headed? The rampant commercialization of Christmas, brought to light in the classic “Miracle on 34th St.” movie, has wrought devastating effects. Our society has become so focused on the material, that we have neglected the fact that Christmas isn’t really about what material things we can get out of our parents or an employee donning the suit of the jolly big guy in red. It is about reflecting and celebrating the point in time that God gave us His greatest gift: the gift of Himself, wrapped up in the most frail and unassuming of packages, the human body. A staggering thing to imagine: that all God was, is, and ever shall be, could co-exist inside a human nature so fragile that it is easily bruised and broken. This is the ultimate Christmas gift, is it not, for God to humble himself? And should we not then do likewise? Shouldn’t such an event give us pause? Should we not consider, perhaps, that this is a clarion call to ever strive to become the best version of ourselves that we could possibly ever be? Christ raised the bar on human existence. He transformed an ordinary existence into something extraordinary, something to be cherished. With Christ this existence then becomes a chance to touch other people’s lives with the best example of Christ’s love we can manage. And yet every Christmas season, because of the rampant commercialism brainwashing soceity to think that Christmas is all about the material and that if your child doesn’t get the latest toy this season then he’ll hate you forever, I see so many people pushing and shoving each other and getting frustrated with each other, something even I’ve been guilty of from time to time. Isn’t this supposed to be a time to wish our fellow man peace and goodwill? To reflect on the awesome gift that is God, Incarnate in flesh? And yet this gift of an Incarnate God was also as brutally opened in the same fashion as we open our regular gifts: the packaging violently torn to shreds. But unlike with our regular gifts, the gift that poured forth as Christ’s flesh, God’s human packaging, was torn asunder, is a gift that shall last unto the end of time: the prospect that we may one day be reunited with a Divine and Loving and Merciful God upon completion of our mortal existence. This gift is such a simple gift and yet gives many people’s lives in this world such great meaning and purpose. And yet this gift sees widespread rejection in this new age of skepticism. Skepticism can be a great tool, this desire to question things. It allows us to be wary of falsehoods and of men who claim powers that you know they could possibly never have. But, taken to extremes, skepticism can rob us of belief in the simple things that make this existence worth living. We now, as a society, are witnessing the rise of human arrogance, the place where unbridled skepticism can lead. Unbridled skepticism leads human beings to think that because reason tells us it cannot be so, then it is not so and can never ever be so. And yet we can plainly see that living by reason alone leads to a dreary existence indeed. And is it any wonder then, that with the rejection of God’s most awesome and gracious Christmas present to us, that we are now seeing an increase in the number of Ebenezer Scrooges in our world? Father in Heaven, hear my prayers that the whole world may come to accept Your most beautiful gift into their hearts. That one day all divisions and strife shall cease and instead of pushing and shoving each other in the stores in order to fulfill the corrupted commercialized vision of Christmas, we may greet each other with Christ-like warmth and joy as we patiently pass each other in search of the gifts that show our families just how much we love and appreciate them. Amen. When reading about the sweetener I use most often, Splenda, online I was awestruck at how many people claim to know beyond a shadow of a doubt that it is toxic and we should not be consuming it at all then begin to push all kinds of natural sweeteners, esp. stevia (an all natural sugar free sweetener made from the stevia plant). Now, I have a preference for natural things as opposed to artificial things too which means I would prefer to use stevia to Splenda. However my budget doesn’t always allow me to shell out the mucho bucks required for all-natural/organic products like the stevia sweetener. So until stevia becomes cost-competitive with Splenda, I shall continue to use splenda. But this preference for a natural sugar-free sweetener does not mean that I have the right to tell lies or half-truths in an attempt to discourage others from consuming these sugar substitutes. I like this guy for providing good sugar-free/low-sugar recipes. I, however, strongly disagree with his assertion that splenda is highly toxic. Let’s begin with his personal experience. He goes into humorous detail about his apparent adverse reaction to it when he ate some candy sweetened with splenda. First of all, just because one person has an adverse reaction to a particular substance doesn’t automatically mean that it is unsafe. this is the “chicken little” fallacy: to run around claiming “the sky is falling” just because something bad happens to one person as a result of doing something that in and of itself is not considered to be unsafe. For example penicillin is not inherently allergenic to everybody just because some of us (like me) happen to break out in hives when exposed to penicillin. So while I can’t use penicillin because of my allergy I can’t go around claiming that penicillin is unsafe for EVERYBODY. Also, I think what happened is that he likely just saw the “sweetened with splenda” logo on the front and didn’t bother checking the ingredients list. So his adverse reaction is his own fault. I would advise him to check the ingredients list on these candies. Because while these candies are indeed sweetened with Splenda, Splenda is not the only sweetener that tends to be present in these sugar-free candies. Many producers of sugar-free candy tend to use sugar alcohols such as maltitol, xylitol, and sorbitol as a bulking agent. While these sweeteners won’t spike blood sugar since they metabolize without needing insulin, these sugar acohols are well-known for causing precisely the adverse reaction that this guy suffered. So Mr. Andrew Muller, check the ingredients list on these candies. I’ll betcha that you’re gonna find either sorbitol, xylitol, or maltitol in addition to splenda in that list. So Splenda is likely not the culprit for your adverse reaction to the candy. Then there is Mr. Muller’s claim that it is toxic for everyone because of the chlorine. OH NOEZ!! NOT THE CHLORINE!! PLEASE!! I’LL DO ANYTHING YOU ASK JUST DON’T GIVE ME THE CHLORINE TREATMENT!!!! Now that my daily venting of my sarcastic side is over, I shall continue. It is true that Splenda molecules contain chlorine, a substance, which in high enough concentrations, can be quite a potent disinfectant. But this doesn’t mean that everything with chlorine in it is dangerous. I’ll give an example of something else containing chlorine that we consume regularly: table salt. Yes salt. That well loved seasoning/flavoring agent. It has chlorine in its molecular make up. Why do you think salt’s scientific name is sodium CHLORIDE?! Yet I don’t see him complaining about ordinary table salt. We’ve been consuming salt for years without any adverse affects (except that people like me with high BP should limit sodium intake and notice I said LIMIT, not CUT OUT ALTOGETHER, an endeavor that would be nigh impossible). His next point is that he claims Splenda increases your appetite. Maybe. Maybe not. But for the sake of argument let’s say it does. An increase in appetite as a result of splenda consumption doesn’t necessarily mean that people are gonna get fat. If you do notice an increase in appetite from Splenda, instead of reaching for that bag of potato chips or that snickers bar, try eating a food item defined by Weight Watchers as a power food (some examples of power foods are: most fruits/veggies, even canned as long as they aren’t packed in added sugar, extra lean ground beef (95% lean) and all-white meat ground turkey (99% lean)). So if splenda does make you have a hunger pang before your next meal, try eating some carrot or celery sticks instead of that high-calorie snack. I can almost guarantee that carrots and celery sticks will hold you over till your next meal a lot better than a snickers bar will. His final claim, which is entirely bogus, is that there have been no credible long-term studies done on Splenda. Are you kidding me?!?!?! 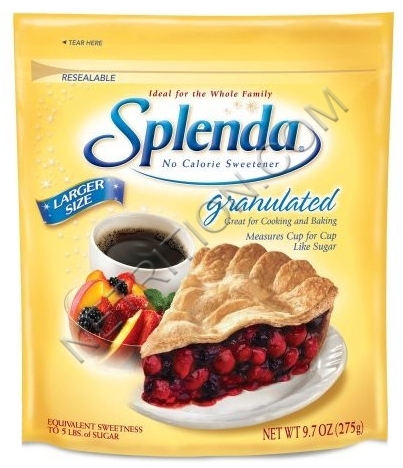 Nutritionists and the FDA and EPA have been studying Splenda ever since it first came out in 1998. They’ve done every study they could think of short of rendering Splenda into component atoms and carrying out the same intensive studies on each of the atoms that make up a molecule of Splenda. In conclusion, common sense and a little chemistry knowledge impel me to render the verdict of generally safe (though a rare few people might exhibit an allergic reaction to it, like my ex-gf for example….she gets a headache from any kind of sugar substitute, even the all-natural stevia sweetener) for human consumption and not inherently responsible for wrecking diets. 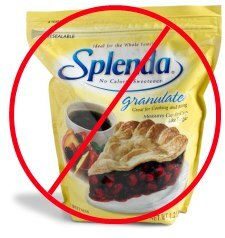 Splenda doesn’t wreck diets or the healthy eating choices that WW encourages you to make. People’s bad food and drink choices, however, ARE the result of weight gain. I would also add in a blurb about aspartame too. People had the same “chicken little” reaction upon learning that aspartame caused cancer in rats. In case you haven’t noticed, a human being is not a rat (unless he is a politician…. :P ). We’re not even the same species. A substance that causes tumors in one species of living thing can be completely harmless in another. I’ve been consuming Crystal Light (which uses aspartame and Ace-K, aka acesulfame potassium) for years now without any adverse health effects. Was Bullying Primary Cause for Jamey’s Suicide? There is nothing more horrendous, no act more inhuman, than to treat your fellow man like something you’d scrape off the bottom of your shoe and discard, no matter what you might think of the lifestyle the person leads. Jamey Rodemeyer was a teen who felt driven to take his own life. A very sad and very tragic time for his family and my prayers are with them. And bullying anywhere is an issue that needs to be addressed. Parents need to step up to the plate and teach their children that bullying is evil and inhumane. But until that happens we need to teach our children how to deal with bullies, by teaching them some moves they can use to defend themselves against physical attacks and how to handle verbal attacks. But is it right to blame bullying as the primary cause of this poor child’s suicide as some are doing? Because many kids are unfortunately bullied, yet many of these kids grow up to lead normal and healthy lives and would never once think of taking their own lives. So it seems to me that the only thing that could be blamed in this case is perhaps insufficient mental health services and counseling to help people who are bullied deal with its mental effects. But it seems to me that the first step would be teaching our children that they are equal in dignity and worth as human beings and to stand up for themselves when someone suggests otherwise through bullying. They’re cheap and their efficiency increases with higher wattage consumption. These wattage consumptions are more than many of us are comfortable with given the increasing energy costs. They’re much more efficient than incandescents and they’ve come to be nearly as cheap as incandescents. They contain unsafe levels of mercury. This results in some hidden costs besides the obvious risk to the environment and our health should the mercury contained in these bulbs leak into the environment. Because of this if you break a CFL bulb you can’t just sweep up the debris and toss it. You have to call in an environmental cleaning crew (who will be wearing HAZMAT suits) and that will likely cost a good couple of thousand bucks. The waste management services of most localities also implement special procedures for dealing with CFL bulb waste, procedures that cost money to implement. This results in a higher local property tax bill for everyone. They’re much more efficient, more efficient than even CFL’s (at least at lower wattage equivalencies such as the 60-watt equivalency). They also contain no mercury, eliminating that risk to our health and the environment. They also last much longer than either incandescents or CFL’s. They cost plenty to buy. 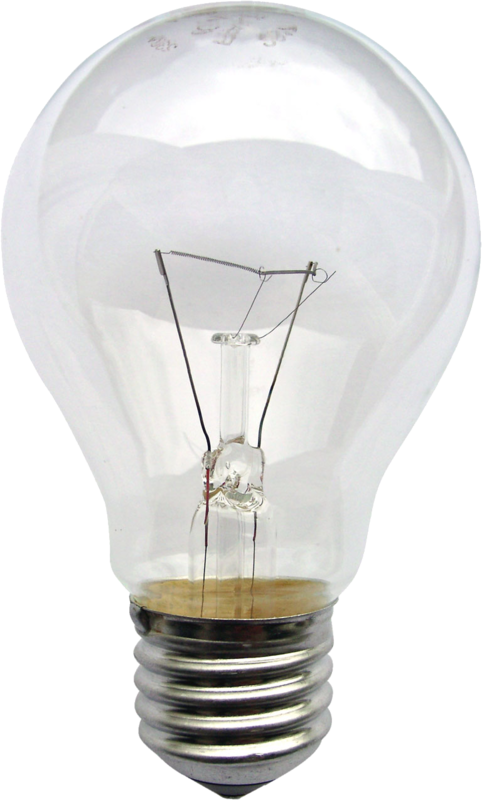 The average LED bulb costs roughly $40 – $50 for a 60-watt equivalent LED bulb. Their efficiency also drops with higher wattage consumption. 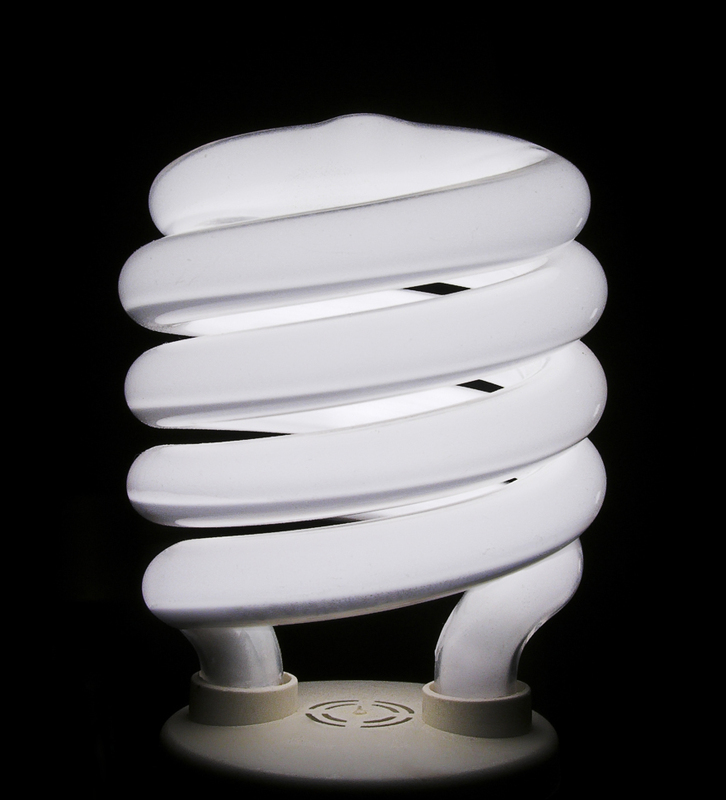 For example: LED’s are more efficient than CFL’s at the 60-watt equivalency but at the 100-watt equivalency, from what I read, an LED bulb would have to consume at least 30 watts of power, giving the CFL the advantage in energy efficiency in this higher wattage equivalency (CFL can produce 100-watt equivalent light consuming only 26 watts of power). Also a 100-watt equiv. 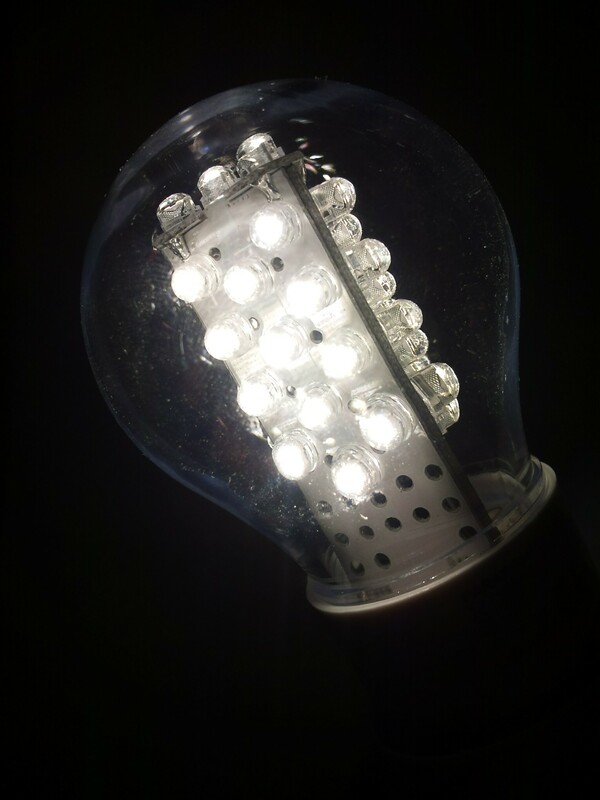 LED would be roughly several times the size of a standard bulb and probably cost roughly $100 – $200! (eek!) But it would still make the LED much more efficient than incandescent bulbs. But despite the cons, if you can afford these initial one-time costs for the LED bulbs, the energy cost savings could possibly offset the cost of the bulbs. The tricky part is actually coming up with the money for these LED bulbs, especially in this tough economy (unless of course Bill Gates is feeling generous enough to replace every light fixture in the US with an LED bulb, but I’m not holding my breath :-P). Recently I have discovered additional insight as to why many Catholics, even those who are otherwise pretty conservative, support things like government welfare, including this health care mess. It has to do with the difference between charity and altruism. Charity, as I have mentioned in previous blogs, is a free will gift of one’s own time, talent, and/or treasure to assist those who are less fortunate than we are. In Catholicism there is the principle of subsidiarity which “is opposed to all forms of collectivism.” Private non-profits (the higher-order entity) adhere to this principle by not forcing us (the lower-order entity) to give to them. In this was we still retain a sense of self when helping others. Charity is the self-ISH concern for the welfare of those who are less fortunate. This is another way collectivists seek to justify their view, by using the fact that we have forgotten that there are 2 different meanings for the term “selfish.” One meaning is the negative one, where being selfish means you exploit others for your own personal gain (the other meaning that you simply have a sense of yourself as a human being with dignity and natural rights). This leads me to altruism. Altruism is the opposite. It is self-LESS concern for others. But as we have seen, help for others without a sense of yourself (which is what self-LESS means) conforms more to the “exploit one group for the sake of another” meaning of “selfish.” In this way when altruism is allowed to take hold as a valid part of any economic system, slavery results. One group is effectively yoked to another in one collective. Kinda like those Borg drones in Star trek: TNG eh? So while charity and altruism may at first glance appear to be synonyms, we see that they are in fact polar opposites. And since collectivism is slavery, and slavery condemned by the teachings of the Catholic Church, government welfare (including ObamaCare) even without provisions that include funding for things like abortions, is still a policy that conflicts with Church teaching. Palm Sunday 2011. The beginning of Holy Week for us Catholics. A sign that Lent is almost over and Easter is almost here. That the time when we can celebrate Christ’s triumph over sin and death, whose triumph grants us freedom from sin so that death no longer holds any power over us, is nearly at hand. We call it Palm Sunday because of the Scripture passage where Christ first enters Jerusalem. He is greeted with open arms and shouts of acclamation and with people waving palms which are then laid along with their cloaks at His feet as He passes. They are overjoyed at his arrival. However just a few days later we see that they had a funny way of showing how much they loved Him. When He first got there they were overjoyed. Then a few days later these very same people hung Him on a cross, and the sins of mankind along with Him. This situation from the Scriptures serves as a stark reminder of the pitfalls of seeking worldly recognition, fame, and riches. These things of the world as we have seen in Christ’s situation are transitory indeed. And such things usually require that you surrender your soul, to sacrifice Truth at the altar of seeking the imperfect and transient material things of the world. These things will never bring you true power and happiness. Only by recognizing that we have the capacity to love others as Christ loves us can we break the power of the world to sell our souls into material slavery.